During each of the twelve days of Christmas, the 1709 Blog is bringing readers some information concerning an author, composer, artist or creator who died in 1941 and whose works fall into the public domain in 2012 in countries which operate a "life plus seventy years" term for copyright in authors' works. Today's author is little known outside his native country, though his best-known work will be familiar to many readers. 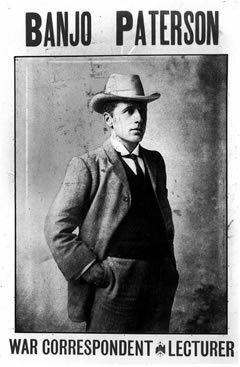 Andrew Barton "Banjo" Paterson’s early years were spent on an isolated station in the Australian outback. As soon as he was old enough to ride a pony, Paterson started school in the tiny village of Binalong, moving on from there to Sydney Grammar School. In addition to demonstrating academic prowess, Paterson was also a successful sportsman with a great love of the outdoors. Although Paterson qualified and worked as a solicitor, he also managed to juggle work as a writer, a jockey, a soldier and a farmer on the side. In 1885 Paterson began having his poems published in a weekly magazine under the pseudonym of ‘Banjo’, the name of a favourite horse. His 1890 poem "The Man from Snowy River" became a national success, and five years later Paterson published a collection of poems with the same name. This anthology remains the most popular collection of Australian Bush poetry to date, and is still being reprinted. During the Second Boer War, Paterson’s work as a journalist and war correspondent spread his name to Britain. After making a decision to abandon journalism and writing in 1908, Paterson’s remarkable versatility was demonstrated further during the First World War, during which he served as an ambulance driver and honorary vet before rising through the ranks from officer to major. After his return to Australia Paterson went back to his poetry and journalism, which he kept up until the end of his life. 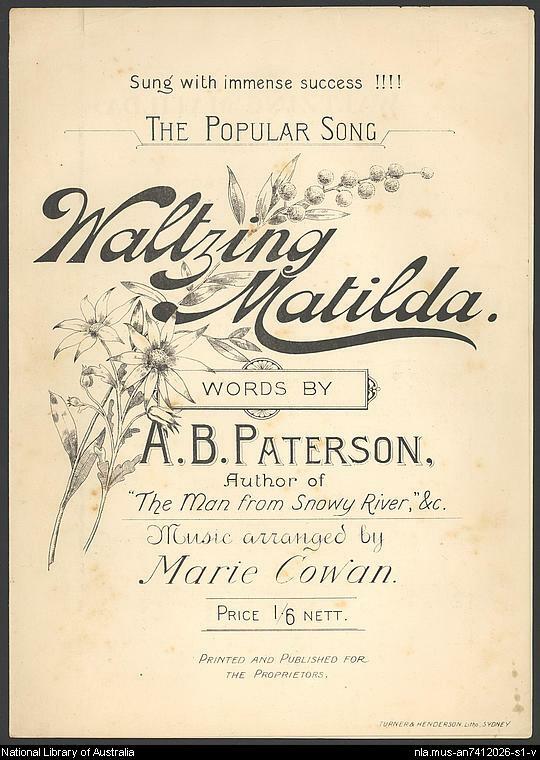 One of Paterson’s best-known poems is "Waltzing Matilda" (1895), a traditional bush ballad which has become the unofficial national anthem of Australia. Paterson was known for his ardent nationalism and deep attachment to Australia’s land and folklore, and the majority of his writing reflects these sources of inspiration.